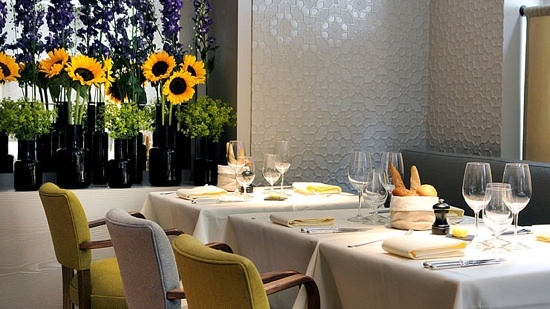 Camilla clearly has great taste choosing the understated yet beautifully stylish Koffmann’s restaurant at The Berkeley in Knightsbridge for yesterday’s very public lunch with Kate Middleton. The 80-seater split level restaurant at this luxurious 5 star hotel was a burst with energy for the party of four including Kate’s sister Pippa and Camilla’s daughter Laura Lopes. Pierre Koffmann (62), the French born chef who returned from virtual self imposed retirement after his massive success at three Michelin starred La Tante Claire tends to shies away from publicity limelight himself. Famed for producing luxurious plates from humble ingredients, Koffmann opened his eponymous restaurant in June 10, on the site of the former Boxwood Café, to the lauded reviews from the critic glitterati. Hearty, robust and seasonal French cooking simply must be sampled. Fancy booking? There are still a few hot seats for Valentine’s day as of this morning so get calling fast. We rather expect this to be the flavour of the month for this important day for the ladies. Call 0207 235 1010.